Can you see what's at the top? Little figures (angels?) blowing trumpets. They're easily missed from floor level. I'd bet you'd never get that in decorations for a new Orthodox synagogue today! 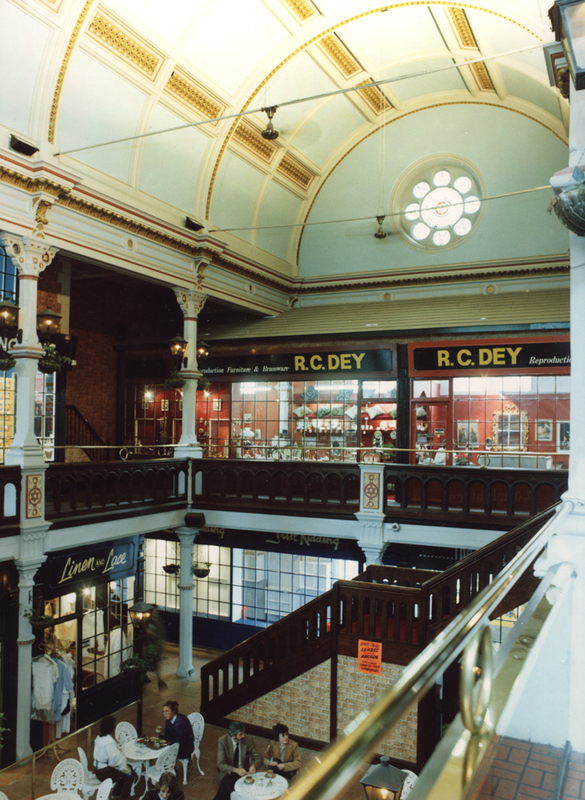 This is Central Arcade, in Newcastle. I read somewhere I can't now find a little while ago about how Routemaster buses were judged the most recognisable symbol of Britain, or something. Well, they aren't. What they are is the most whatever-it-was of London, and portraying them as representative of Britain is yet another example of London-centric thinking (though I will grant that as far as foreigners are concerned, it will be features of London that represent Britain for them). Where I grew up, there was nary a Routemaster in sight. Indeed, only half of the buses, the ones operated by Northumbria, were red, and even those were later repainted to match the company's revised branding. This, though it looks a bit funny to my eyes now, was the right colour for buses to appear when I was little: that, and red (and green in Leeds). FWIW, the child fare on one of these buses was, at the time, 5p. (I remember a friend telling the story of how a driver refused to give him change when he tried to buy a 5p ticket with a £20 note!) It's now 60p; why has it risen so much more than inflation? At its height, after the War, the Newcastle community numbered 4500. I think the numbers were in decline ever since then, though it took until the 1970s for any sense of decline to become apparent, and the 1980s for anyone to think of doing anything about it (by which time it was too late). By the time of my barmitzvah, the community was down to about 1300 (it's now two or three hundred), one of the three Orthodox synagogues extant when I was growing up had already closed, and the other two were about to be closed and replaced by a new one in the centre of where the community now lived. * The brass rail around the women's gallery visible in the abovelinked photograph of Leazes shul is actually the only feature I remember from when it was a shul: It shut when I was five, and the brass rail would have been at eye-level for me! In fact, the first photo is a composite: the sun was reflecting so brightly off the mosaic in the original you couldn't make the words out. There are a few exterior changes which have been made: the foundation stones have been removed, along with a representation of the two tablets of stone at the top; here's how the building originally looked. Here's a photo of what the shul looked like from the inside, that I don't have permission to embed directly in this post. (I used to sit just off the bottom left!) Notable features include the beautiful ornate wooden ark (which probably met a miserable end after the synagogue's closure), the stained glass window (somewhat overexposed here) showing ה׳ surrounded by rays of light (you can still see the one on the other end of the building in the exterior photograph), and the intricate brass chandeliers. 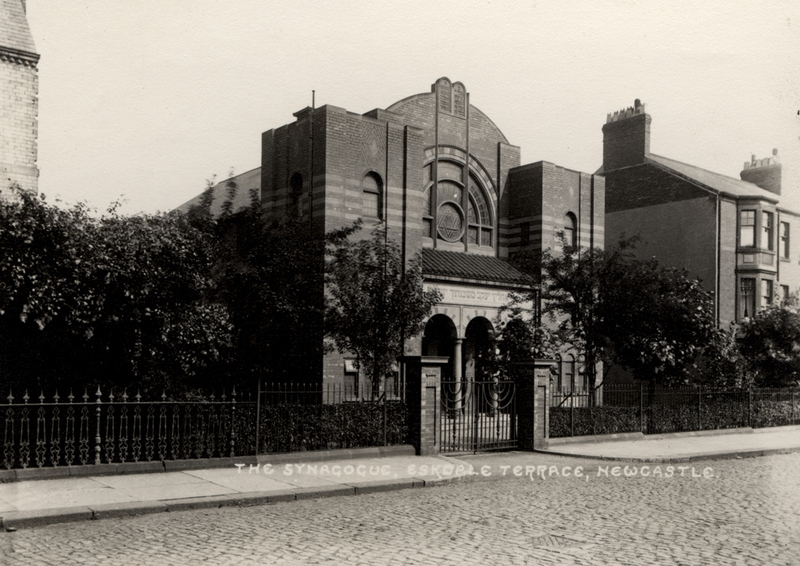 It was decades after the shul closed, however, in the age of Wikipedia, that I discovered the irony in the name Jesmond Synagogue: "Jesmond", it turns out, derives from "Jesus Mound".